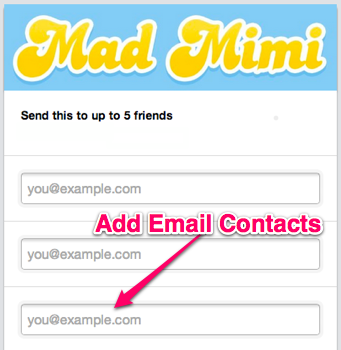 All Mad Mimi email newsletters include a few standard links in the promotion footer. These links offer readers the options to view your promotion on the web, unsubscribe and of course, forward the newsletter to a friend. How Does Forward To A Friend Work? 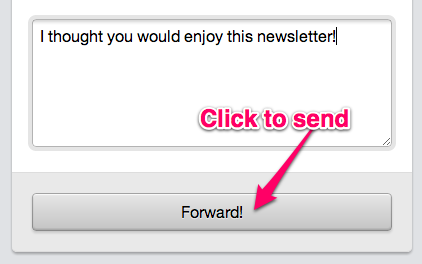 When a reader clicks the forward to a friend link, they’ll land on a standard form page, with the option enter up to 5 friends’ emails for forwarding. While you can’t see the contact emails that received the promotion via forward (they’ll have to subscribe first! ), you can track which contacts in your audience shared the promotion via forward link. Can I Change the Location of my Forward, or Subscribe Link? Can I Edit My Footer? How Do I Change the Subscribe Link in my Footer?